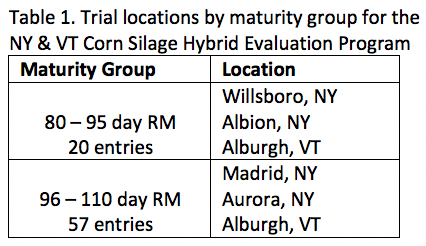 The New York & Vermont Corn Silage Hybrid Evaluation Program continues to provide side by side evaluation of corn hybrids grown under a range of growing conditions representative of those experienced in the Northeast. In 2018 the program evaluated 77 hybrids from 17 different seed brands. Each hybrid was planted in replicated plots at 3 locations based on relative maturity (RM; Table 1). The growing season was defined by below average precipitation and above average heat, measured as growing degree days (GDD) across trial locations (Figure 1). A defining difference between trial locations was the timing and amount of rainfall from late July to early September. While all locations realized some level of improvement in growing conditions with more frequent rainfall in late July and August, its timing and impact on the crop varied. In general, rain arrived at all locations in time to facilitate normal pollination of the crop but ear development varied by location. The above average GDD accumulation throughout the season and particularly as the crop neared maturity resulted in fast dry down of the crop to target whole plant moisture content for silage harvest. A noticeable characteristic at harvest in many corn fields, including trial fields, was a healthy green plant with a dry ear. While nutrient inputs at all locations met or exceeded crop needs, a lack of soil moisture may have compromised nutrient uptake at varying stages of crop development. Recognizing these real world influences and how a hybrid might perform under varying stressors is important to understand when evaluating this data. The influence of growing conditions lead to location variability in hybrid performance in 2018 but overall better performance when compared to growing conditions experienced in 2017 (Figure 2). The full report provides detailed data on individual hybrids entered into the program for 2018. The most significant parameters in the report vary by individual farm and that farms resources but some of the key data includes, yield, whole plant dry matter, starch content, measurements of fiber digestibility including neutral detergent fiber (NDF) digestibility at 30 hours (NDFD30) and undigested NDF at 240 hours (uNDF240), and predicted milk yields modeled in the Cornell Net Carbohydrate and Protein Synthesis (CNCPS) model. The CNCPS model predicts the expected milk yield of different hybrids based on their inclusion into a high corn silage total mixed ration representative of the diets fed on many NY and Northeast dairy farms. It is important to evaluate this data in the context of your farm when selecting hybrids. The top performing hybrid at any one location or in any one category may not be a good fit for your feeding program. Factors that influence this vary by farm but include land base, soil resources, forage inventory, quality of available hay crops, access and cost of supplemental ingredients, and expectations of cow performance. The trial results and location averages serve as a means to calibrate hybrid performance to a particular growing season and these averages can be used in conjunction with a company’s data on hybrids in their lineup, including hybrids not entered into these trials, to understand how a hybrid performed relative to what is realistic for that growing season. For example, in Figure 2 we see that over 50% of samples taken in 2018 had an uNDF240 value between 9 and 10 so this can be used to evaluate how close and far away from these values other hybrids performed in 2018. However, due to the challenging growing conditions experienced in 2017 and the impact of growing conditions on fiber digestibility we see that the highest percentage of samples in 2017 had a uNDF240 value of 13-14 while a very small percentage (less than 10%) of 2017 samples were as digestible as the majority of 2018 samples. Therefore it would not be fair to hold hybrid fiber digestibility or other performance indicators from 2017 to the same standards as 2018. Mold and mycotoxin development in corn ears and stalks, and the resulting corn silage continues to be a major concern for dairy producers. Mycotoxins can result in a range of problems for livestock throughout the year as they are ingested with the feed. The presence of mold does not always have a strong correlation to mycotoxin development but it does present the chance for incidence to occur. A number of factors influence the prevalence of molds from year to year. Conducive weather conditions for mold and mycotoxin development are outside the control of management options. But hybrid characteristics and physical damage to the ears can be managed through the selection of hybrids and pest resistance traits in the hybrids. 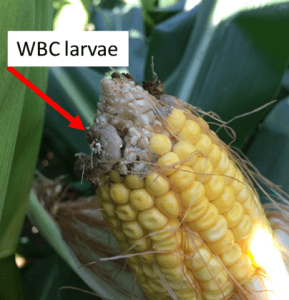 Western Bean Cutworm (WBC) is a pest of corn (as well as dry beans) and its territory has been expanding eastward over the last 10 to 15 years with pockets of high populations now found in New York and Ontario, Canada. The moth emerges near the time of corn tasseling and lays its eggs near the ear leaf of a pollinating corn plant. When the larvae hatch they enter the corn ear, often opening a wound in the husk, and feeding on kernels. Unlike other earworms, which are cannibalistic, you can find multiple WBC larvae feeding on one ear, increasing the chances for significant ear damage. Where WBC populations are high, the corresponding ear damage from WBC feeding can leave wounded corn ears more susceptible to pathogen development, but a clear relationship between ear damage and mycotoxin development has not been documented. A number of mold species may develop on corn ears though relatively few of these produce mycotoxins. Principal concern in New York is with the mycotoxins deoxynivalenol (DON or vomitoxin) and zearalenone (ZON), both produced by the fungus Fusarium graminearum. Infection by this fungus also occurs in roots and stalks and leads to Gibberella stalk rot and the accumulation of DON and ZON in stalk tissues. Much of the toxin loading in 2018 corn silage in New York was contributed by contaminated stalks as well as ear tissues. While WBC damage to corn ears can be significant and may have detrimental effects on corn grain yield and quality, the economic impact on corn silage is less understood. For corn silage growers, understanding whether or not this pest significantly impacts the yield or quality of the forage is critical to their decision making for managing this pest. Since the Cry1F protein, which has most commonly been utilized for protection against numerous corn insect pests, has been found to be ineffective against WBC, producers are left with limited management options. Currently, the Vip3A trait in select corn hybrids in combination with a scout and spray program is the best option for WBC management in areas where the pest is prevalent. With the increased population of WBC in NY, the Commercial Corn Silage Hybrid Evaluation program conducted by Cornell University in collaboration with the University of Vermont and the Northeast dairy industry offers a good opportunity to evaluate numerous hybrids for ear damage from WBC and mycotoxins. This was done in 2017 and 2018 with financial support from both the New York Corn Growers Association and the Northern New York Agricultural Development Program. Each hybrid is planted (in triplicate) at two locations in NY and one location in Vermont (VT), with the locations each hybrid planted at based on hybrid relative maturity (Table 1). Mycotoxin screening was limited to the NY locations based on funding available. 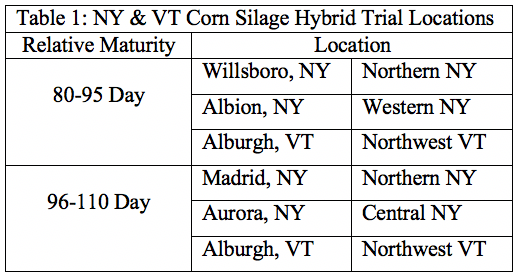 In 2017, composite whole plant silage samples (3 replicates combined) were taken for each hybrid at two locations; Madrid in Northern NY and Aurora in Central NY. In 2018, a slightly different strategy was used with individual replicate samples taken on a subset of hybrids at each location. Both seasons, each plot was scouted prior to harvest to assess WBC feeding damage to the ears. At harvest a whole plant silage sample was collected and submitted to the Dairy One forage laboratory for a mycotoxin screening package which included aflatoxins B1, B2, G1, G2, vomitoxin, 3-acetyl DON, 15-acetyl DON, zearalenone, and T2 toxin. Through the New York State Integrated Pest Management (NYS IPM) WBC Pheromone Trapping Network, WBC populations were monitored at each location. Though it should be noted that as the traps only attract male moths, they help in understanding geographic differences in WBC population but may not be representative of the population of egg laying females. The results of the WBC and mycotoxin screening project revealed large differences in the pheromone trap counts and the number of plots damaged by WBC (Tables 2a and 2b). There was also wide variation in the prevalence of samples testing positive for mycotoxins, particularly in 2018. However, there was a lack of correlation between WBC damage and incidence of mycotoxins in both years (Table 2a and 2b). Additionally, despite the damage to corn kernels inflicted by WBC, in plots with up to 60% of ears showing some level of WBC damage, the WBC feeding did not correlate to any negative impact on silage yield or forage starch content in this study. The most prevalent species of mycotoxin-producing mold found in the screening was Fusarium graminearum. This fungal pathogen can also infect corn ears through the silk channels at the time of pollination during favorable weather conditions and result in contamination of the grain and silage with the mycotoxins DON, 3-ADON, 15-ADON, or zearalenone. A review of the weather data from both years (despite very different overall weather patterns) showed wet conditions at silking conducive to this type of infection. As expected for New York, no aflatoxins were detected. While there aren’t many in-field management options to reduce the chances of mycotoxin development (note that controlling plant diseases and mycotoxins are not the same thing), harvesting corn silage at the proper whole plant dry matter is helpful. Based on numerous field observations, and notable at the 2018 Aurora location in this study, a whole plant dry matter in the high 30’s or above appears to increase the risk of mycotoxin development. While there are numerous ways in which molds can establish themselves in forages, this study reflects a common challenge researchers face while attempting to document the conditions where mycotoxin development is likely. These results, over two growing seasons, provide no evidence that WBC damage is an added risk factor for corn silage growers who are worried about deoxynivalenol and zearalenone in their silage. In areas of the country where other toxins are more prevalent the impact of WBC and other insect pest may differ. It is important to note that these results do not reflect what may occur in corn harvested for grain because the time between silage harvest and grain harvest offers additional opportunities for infection and growth. Growers should continue to scout for this pest and weigh the cost of control with the potential for damage. However, it does not appear that controlling WBC should be viewed as a significant management consideration for reducing the risk of mycotoxin development in corn for silage. Forage sorghum is a drought and heat tolerant warm-season grass that can be used for silage on dairy farms. It can be a good alternative to corn silage in New York particularly during drought years or in the case of delayed planting in the spring. Forage sorghum requires soil temperatures of at least 60°F for planting, which normally occurs in early June in New York. Forage sorghum could also be a good fit for double cropping rotations because its later planting date gives time for an early May harvest of a forage winter cereal. Between 2013 and 2017, we conducted 13 N-rate trials across three regions of New York to evaluate nitrogen (N) needs for a brown midrib (BMR) forage sorghum variety (Alta Seeds AF7102). The trials were planted between early June and early July in central New York (eight trials) and northern New York (five trials). Of the northern New York trials, three were on commercial farms. The other trials were on Cornell research farms. Two of the three trials on commercial farms were conducted on fields with recent manure or legume histories. For eleven of the trials, sorghum was planted at a 1-inch seeding depth and 15-inch row spacing (15 lbs/acre seeding rate). The remaining two trials were planted either with a 30-inch or 7.5-inch row spacing. Five N-rates as Agrotain®-treated urea (Koch Agronomic Services, LLC, Wichita, KS) were broadcasted at planting (0, 50, 100, 150, and 200 lbs N/acre) with two additional N rates (250 and 300 lbs N/acre) for one of the central New York locations. The forage sorghum was harvested at the soft dough stage, which occurred between September 20 and October 14. Harvest was done using a 4-inch cutting height and dry matter (DM) yield was measured. This allowed for determination of the most economic rate of N (MERN), the N use efficiency (NUE), and the apparent N recovery (ANR). The NUE and ANR are measures of N efficiency. The NUE is the amount of N taken up in relation to yield, and is calculated by subtracting the yield when no N was applied in the spring from the yield when N was applied, and dividing that value by the N rate applied (NUE [lbs DM/lbs N] = [Triticale yieldN rate – Triticale yield­0 N]/N rate). A higher NUE means that more of the N that was applied was taken up by the sorghum. The ANR is the amount of fertilizer N recovered, calculated by subtracting the N in the forage when no N was applied from the N in the forage when N was applied, and dividing that value by the N rate applied (ANR [%] = [Forage N of Nrate – Forage N of N0]/N rate). The crop yield response to N could be separated into three yield response groups: (1) no response to N addition (MERN = 0; two trials), (2) no yield plateau (MERN > 200 kg N ha-1; four trials), and (3) a yield plateau between the lowest and highest N rates (seven trials) (Figure 1). The two trials on fields at commercial farms with a recent manure or legume history did not respond to N addition (group 1 trials, panel A). The trial in group 1 with the lowest yield (5.3 tons DM/ac) was planted with a 30-inch row spacing, which resulted in weed issues that likely impacted crop performance. Trials in group 2 (panel B) were either very responsive to N addition or had N uptake limitations, most likely reflecting weather or soil drainage issues. The trials in group 3 (panel C) had MERNs ranging from 134 to 234 lbs N/acre, averaging 181 lbs N/acre. Yields at the MERN for group 3 trials ranged from 6.7 to 10.4 tons DM/acre and averaged 8.9 tons DM/acre. On average, for responsive sites (so excluding group 1 trials), forage sorghum required approximately 20 lbs N/acre per ton DM. On average, for each ton of DM, 25 lbs of N was taken up by the sorghum. For group 3, higher N rates led to lower ANR and NUE (Figure 2). For these trials, NUE at the MERN averaged 56 lbs DM/lbs N and ANR at the MERN averaged 83%. Figure 1: Impact of N application on forage sorghum yield for 13 trials from 2013 to 2017. Sorghum was harvested at the soft dough stage. Two trials did not respond to N (A), four trials did not have a yield plateau (B), and seven trials had a yield plateau between the lowest and highest N rates (C). Differences are likely due to sites native N supply, weather conditions, agronomic practices, and/or soil properties (see text for further details). Different symbols represent different sites within each group. Figure 2: Forage sorghum nitrogen use efficiency (NUE, A) and apparent N recovery (ANR, B) as impacted by N application rate for seven trials with a most economic rate of N between the highest and lowest N rates. Different shapes represent different trials within each group. Forage sorghum can be a good alternative to corn silage in years of drought, delayed corn planting, or as part of a double crop rotation with forage winter cereals. The BMR forage sorghum in this study, grown on N-limited sites, needed around 180 lbs N/acre, or around 20 lbs N per ton of DM, and yielded between 7 and 10 tons DM per acre. Fields with recent manure or legume histories supplied sufficient N, resulting in no crop response to additional N for the forage sorghum. Applying N beyond the N needs of the crop will result in reduced N use efficiencies. In addition, stands with row spacing greater than the recommended 15 inches may result in weed or other stand issues that could impact performance. This work was supported by Federal Formula Funds, and grants from the Northern New York Agricultural Development Program (NNYADP), New York Farm Viability Institute (NYFVI), and Northeast Sustainable Agriculture Research and Education (NESARE). For questions about these results, contact Quirine M. Ketterings at 607-255-3061 or qmk2@cornell.edu, and/or visit the Cornell Nutrient Management Spear Program website at: http://nmsp.cals.cornell.edu/.